we are the right men and women to be hired by you!" Fox Force Five is the name of our flying squadron consisting of scoundrels, adventures and soldiers of fortune. Our Squadron was founded in Sky Haven in 1937. During our adventures we captured a zeppelin, the desperados cello, which is now our new home and gets us into the action around the world. We have informants and contacts in Sky Haven and Manhattan. Our key account is A.Z.C. 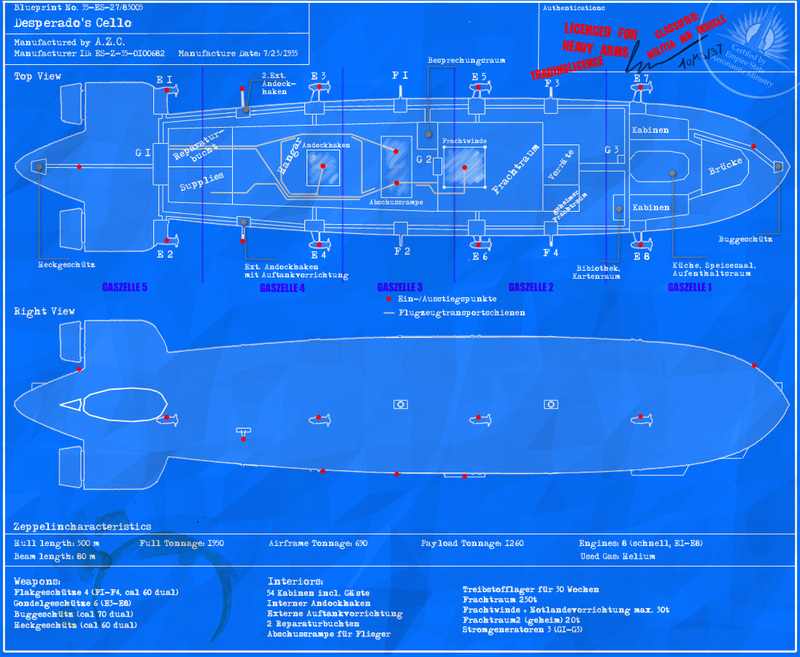 (Advanced Zeppelin Constructions). During our mission in Bejing the Desperados Cello was destroyed by the Communist Chinees Airfleet. We are a bunch of Crimson Skies fans dedicated to the old boardgame by FASA. We are playing our pilots in an ongoing campaign, in which we add some RPG elements to get deeper into the world of CS. We created a lot of new content for this game, including rules, background informations and game maps. On this site we want to share our ideas to the CS community. Our Logbook is only in German Language available! Desperado's Cello is the mobile Home of FF5. It is a 450 meters long zepplin. Hier habe ich versucht alle Szenarien und ihre Meister aufzulisten. Diese Info ist ja nur für uns wichtig und deswegen nur auf deutsch. 2 Money Train Herbert Michi O. 3 Überfall auf Raffinerie Gutthy Michi O. 15 Der Sky Haven Convoy Gutthy Michi O.